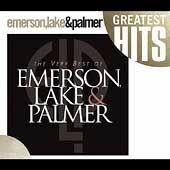 This was the first exposure I had to Emerson, Lake, & Palmer beyond what I heard on the radio. It ultimately got me into the group, so I suppose this album is good for those uninitiated to progressive rock. That said, this is certainly not the best of this band by any means, but even though it may sucker some people who look for a couple of songs, it can be a great starter album for others. While not an ideal compilation, this release is a good place for someone new to Emerson, Lake, and Palmer to begin, as it has many favorites. The problem is that for the progressive rock fan, what is here is stuff heard on the radio all the time anyway. There is absolutely nothing from Tarkus, and what is from Brain Salad Surgery isn't particularly important. "Pirates" is a great addition to this collection, however, which is a song I always felt was underrated, even if it can be a tad corny. The climax of Pictures at an Exhibition is present, but as with any holistic release, excepts simply cannot do justice. For the right price, this is a great starting point, but it is likely full albums can be had at cheaper prices.